On Nov. 9, a tragedy occurred that shook residents among Northern California. The “Campfire”, a catastrophic wildfire, had repercussions that impacted not only its’ origin in Butte County, but students across John F. Kennedy High School as well. The horrific natural disaster – which killed dozens of people, destroyed more than 153,000 acres of land, and is labeled as the deadliest wildfire in California history – has thankfully, been contained. Pushed by wind from the north, smoke from Butte County engulfed the Sacramento Region. Seeing people among the streets, at the grocery store, and even on our own campus wearing masks became the new norm. The day after the Campfire began, air particle levels in the Sacramento area were gradually increasing day by day as seen in the county’s air quality index. 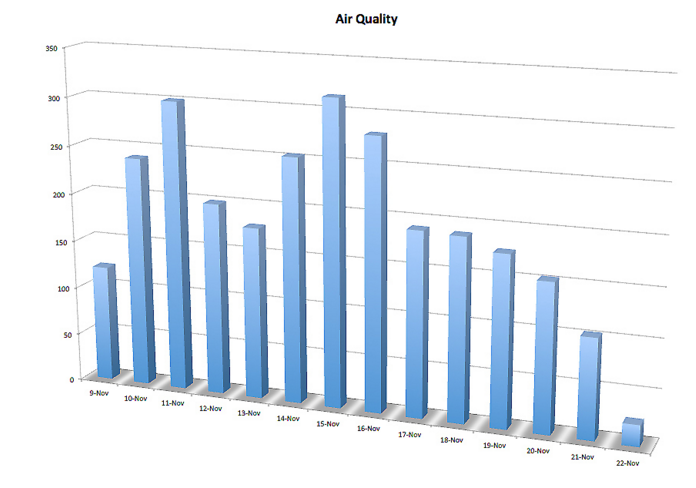 With data provided by sparetheair.com, The Clarion constructed a graph documenting the air quality during the time in which the Campfire Wildfire burned. This was determined by an AQI chart, which categorizes the air qualities into levels of concern: good, moderate, unhealthy for sensitive groups, very unhealthy, and hazardous. An air quality index, AQI, is a number used by the government to communicate how polluted the air currently is or how polluted it will be. As an AQI increases, a large percentage of the population is likely to experience increasingly minimal or severe adverse health effects. After day one, which had an AQI of 121, students across Kennedy began to encounter issues regarding their health. Many students, particularly those who have respiratory problems, suffered greatly due to the wildfire. By Nov. 10, Sacramento’s AQI had risen into the “Very Unhealthy” and “Hazardous” range. Throughout the week of Nov. 11, school had not been canceled for students of SCUSD until that Friday – resulting in much uproar from students. Many were upset that the district hadn’t taken student wellbeing into consideration and cancelled school sooner until the day following the 15. As seen in the graph, this day had been the worst one for Sacramento, where students became physically ill with side effects such as vomiting, horrible migraines, and fatigue. However, Kennedy had no control over when school could or could not be in session, but rather it was SCUSD who made the decisions regarding this. In a press release sent out on Nov. 16, the district announced that school would be canceled that Friday saying, “Air quality levels are hazardous in Sacramento. Please keep your children indoors.” This is quite contradictory considering the air the previous day was labeled as “hazardous”, with a shocking AQI of 314, and school was still not canceled. It seems as if Kennedy didn’t help aid the situation either as many students continued to remain outdoors, and nothing but an overhead announcement was given telling students to remain inside. Wildfires are plenty in California. This isn’t the first and won’t be the last time a fire of this magnitude occurs. Both SCUSD and Kennedy need to get their priorities in order, and establish a better way to handle the situation. All of us should view this as a learning experience and take note of what can be done better if this were to occur again. ELECTION WATCH Does Our Divided Nation Make Kennedy a Divided Campus?